For more than a year Intel has talked about graduating from copper wires to fiber optics for Thunderbolt ports on Apple’s Macs, and Sumitomo Electric Industries has became one of the first companies to deliver optical cables. Sumitomo is now shipping test samples of optical Thunderbolt cables, which were also used in demonstrations at Intel’s booth during the NAB show last week in Las Vegas. The Sumitomo optical cables will enable longer cable runs than the current Thunderbolt copper cables, an Intel spokesman said. Optical Thunderbolt cables from Sumitomo Electric Industries enable longer data runs than current copper cables. Thunderbolt is a high-speed connector technology that shuttles data between computers and peripherals. The first ports were introduced in Apple’s MacBook Pros in February last year, and current cables are based on copper because of the high cost of fiber optics. 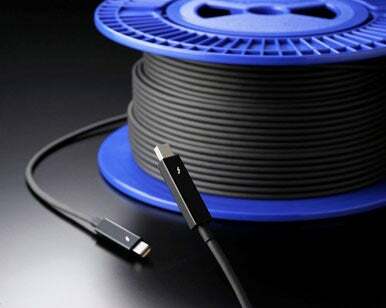 The cables are also as thin and durable as the copper cables, Sumitomo said. The optical cable can be used in consumer devices and “will provide high bend performance even when pinched by up to 180 degrees or tangled in knots,” the company said. A downside of fiber optics is that peripherals will need their own power supply over long cable runs. Optical fibers don’t carry power, and copper has the advantage of providing up to 10 watts of power over a cable. Intel has said that optical cables will also enable transfer throughput. Intel is making Thunderbolt faster by adding internal support for the faster PCI-Express 3.0 bus, which is now available in Intel’s recently introduced Core processors code-named Ivy Bridge.